Lettuces are fast growing and versatile. Now that the weather is cooling and autumn is really here it is a great time to plant lettuces. If you immediately think of the ubiquitous plain green hearting types like icebergs, then think again. Don’t get me wrong, I love a good crisp hearting lettuce but lettuces aren’t lettuces any more. They are red and yellow and spotted and bitter and sweet and curled and smooth. They are also fast growing and versatile. Grow them in pots and hanging baskets, use them to fill an empty spot as slower growing crops develop or grow them as a border in an ornamental garden bed. With the variety available you should never be without lettuce to add to your salads. These versatile salad plants do best in a humus rich soil that is well drained. If you are planting in a pot use a really good potting mix, or a cheaper one to which you add some coir (coconut fibre) and compost at the ratio of 2:1:1. If you are planting in the ground you don’t need the coir unless the soil is very sandy, but you will need to add well-rotted manure and/or compost, half a barrow load to each square metre. Dig in well and smooth over the surface ready for planting either seed or seedlings. 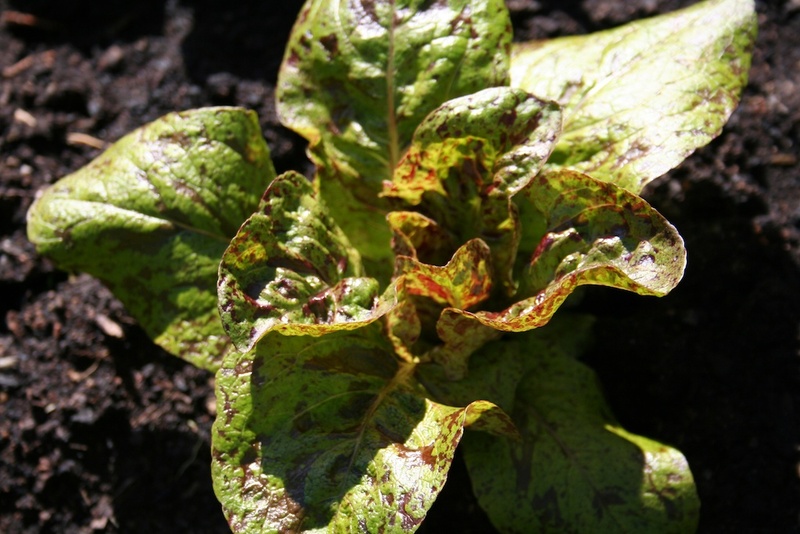 Lettuces do best in slight acid soils with a pH of about 6. 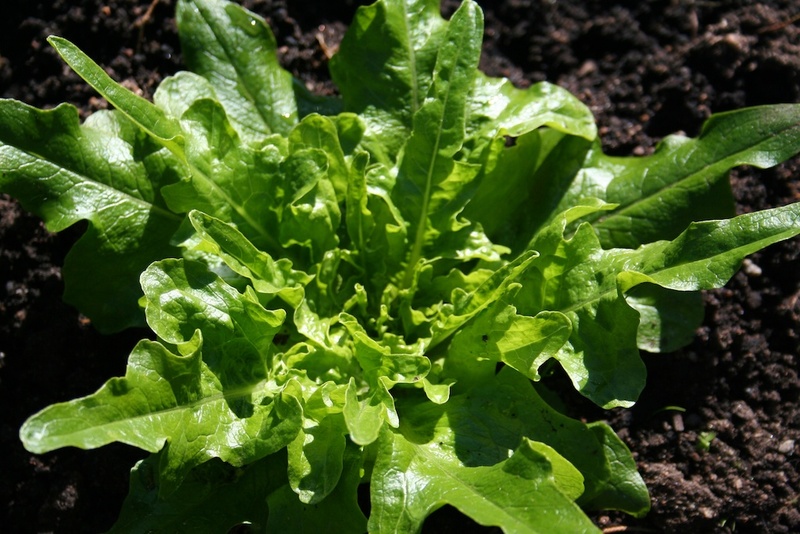 Lettuces are annuals that grow easily from seed but you can also purchase seedlings. Sow seed in rows about 30cm apart, and cover with only a very thin layer of fine soil. Water gently and keep moist until the plants are well established. Seed will not germinate once temperatures reach 30°C and optimum germination is 10°- 20°C. You may also need to put a netting screen over the top to protect them from birds. When the seedlings are a few centimeters high you can start thinning to about 25cm between plants. Eat the thinnings. If you purchase seedlings, make sure they are new and young, don’t purchase a tired old punnet with over-grown plants as they may just go straight to seed after planting. Always plant seedlings in the cool of the day, and if possible shade plants for the first few days until they are established. Lettuce likes sun for about half the day in summer, preferably morning sun. In colder weather they tolerate more sunlight so choose your position depending on the time of year. Most lettuces dislike really hot conditions, especially when it is combined with high humidity. 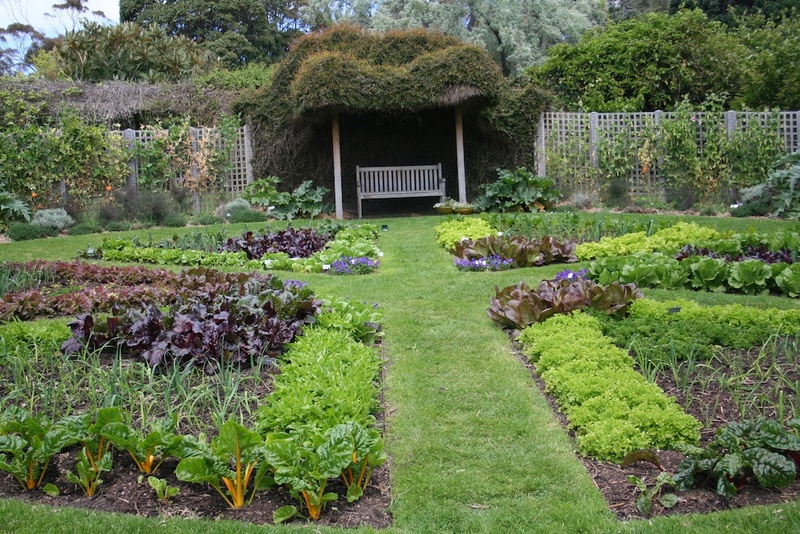 If you want to grow lettuce in the middle of summer, then grow it in a shady position. Mulch the soil with pea or lucerne straw or sugar cane mulch to make sure that lettuces never dry out, or the leaves will be bitter. Water with seaweed emulsion and fish emulsion or weed tea or worm juice or liquid compost every couple of weeks. In warm humid regions don’t over water as this can cause rotting and wilting. The term bolting is used to describe what a plant does when it starts to produce flower heads and go to seed, usually before we want it to. 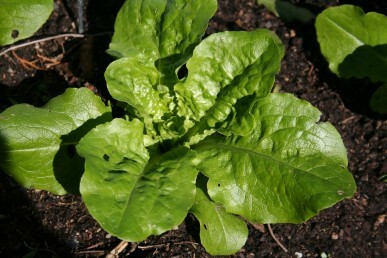 With lettuces and other leafy salad plants, it is the leaf we want to use. So we grow types that are slow to bolt. 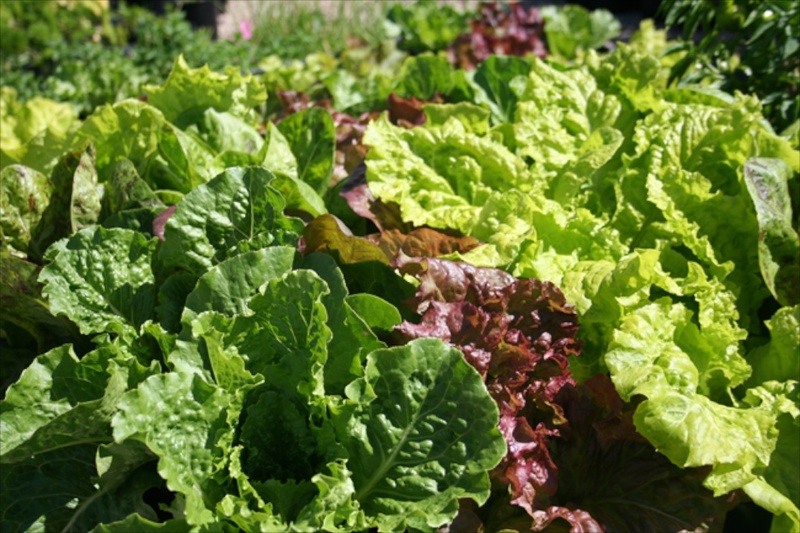 Lettuces are relatively pest free. Young plants will need protection from snails and slugs. If they are affected by aphids then spray with soap spray. Lettuce is probably the simplest of all plants to save seed from. They are self pollinating and will often self sow. Don’t keep early bolters as this will mean that the strain you are saving will always bolt to seed earlier than you want. If you are collecting seed from more than one variety, then make sure they are separated by several metres. Just leave the plants to flower and once about half the flowers have produced fluffy seed, pick the whole plant and hang upside down in a dry airy position. When it is completely dry, rub the flower head between your hands over a large bowl. The black, brown or white seed will collect with the fluffy chaff. When you have finished, shake the bowl and the seed will fall to the bottom. Scoop the chaff from the top and discard. You can collect as many as 60,000 seeds from one plant! The seed can be stored in dry, cool, dark conditions for up to 5 years. Mignonette lettuce is a butterhead type. These lettuces have crunchy, tender usually light green leaves and large solid heads but they do not do well in hot and humid weather. They are not suitable for the tropics, or for very hot weather in other regions. ‘Superior’ like ‘Great Lakes’ but crisper. 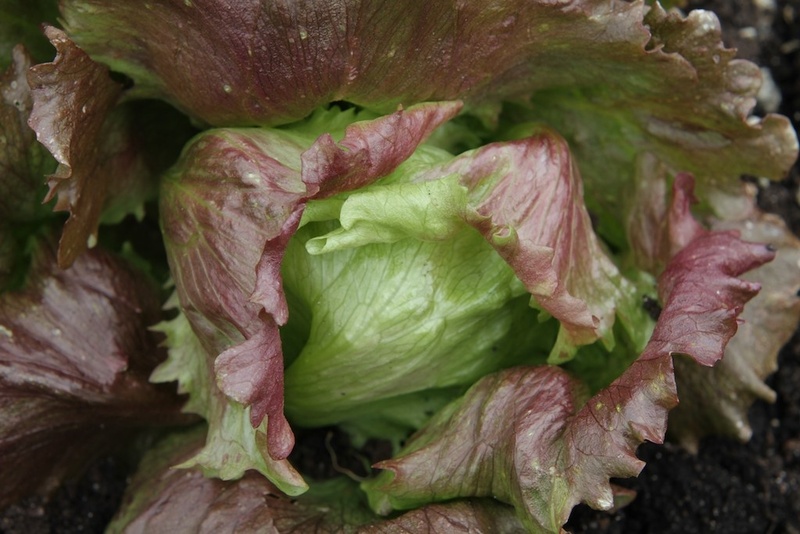 ‘Red Iceberg’ forms a head of crinkled burgundy tinged leaves in as little as 40 days. These types are the most heat tolerant and probably the easiest to grow. They grow as an open clump of leaves and don’t form a head. Harvest over a long period, pick individual leaves whenever needed, this is known as ‘cut and come again’. Sow at any time of the year. Most of these take around 25 days to get to micro salad mix size and 45-50 days to reach full size. ‘Amish Deer Tongue’ pale green, soft leaves. Good cool climate. Can be cooked like spinach. ‘Goldrush’ golden crinkled leaves, very slow to bolt. ‘Green Coral’ and ‘Red Coral’ deeply divided with bright green or red leaves. ‘Green Mignonette’ butterhead type with tender and sweet, deep green frilled leaves. Usually harvest whole head. ‘Lollo Rossa’ frilly, red tinged leaves, heat tolerant and very decorative. ‘Royal Oakleaf’ very decorative with bright green, deeply lobed leaves, also a purple form. Leaves don’t get bitter even in really hot weather. ‘Salad Bowl Red’ and ‘Salad Bowl Green’ long, lobed leaves, either burgundy or green. Good in the tropics, very decorative. 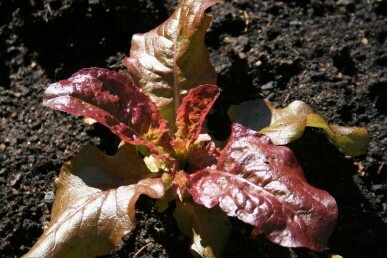 These lettuces have crisp, juicy, sweet leaves. Very hardy and bolt resistant. Can harvest outside leaves over a long period, or the whole lettuce. Sow 15-20cm apart to force upright growth. Up to 68 days to full size. ‘Baby Cos’ bright green, mini, good for pots. ‘Cos Verdi’ open upright, dark green leaves. ‘Little Gem’ mini cos type with crisp leaves, cream on inside, dark green outside. Heat tolerant. ‘Paris Island Cos’ upright, dark green outer leaves, cream in centre. Good in the heat. ‘Red Leprechaun Mini’ soft upright leaves, shiny red. 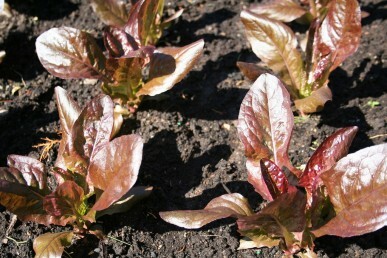 ‘Rough d’Hiver or ‘Brown Romaine’ burgundy edged dark green leaves, upright but non hearting, heat resistant.